Nvidia not planning on taking apple's slam without a response. 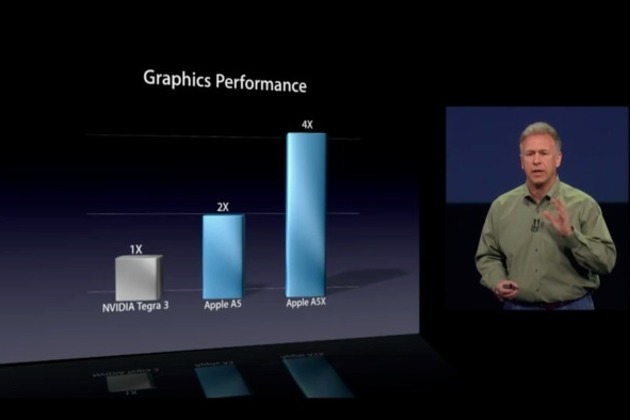 Remember a few hours ago, when Apple claimed its new A5X chip had four times the graphical prowess of Nvidia's Tegra 3? As you might imagine, Nvidia doesn't intend to simply let that be. The graphics firm told ZDNet that without specific benchmarks to back up that claim, "Apple has a very generic statement" right now, but that Nvidia would certainly be purchasing a third-generation iPad on March 16th to test those claims for itself. Citations or no, if the new iPad does indeed have twice the graphical potential of the iPad 2, the "4x" quote might not be too far off in certain applications: AnandTech ran the Tegra 3-powered Transformer Prime against the iPad 2 in a run of GLBenchmark, and found a few performance differences.